In addition to our legal intelligence platform, Legal Atlas regularly produces both published and unpublished reports. Topics are wide ranging, covering wildlife, environment, marine fisheries, linear infrastructure, criminal law and more. ​Legal Atlas has ability to rapidly create and access organized sets of legislation specific to a topic to conduct comparative legal assessments, gap analyses and best practice development at national, regional and international scales. Following the Money: Wildlife Crimes in Anti-Money Laundering Laws. 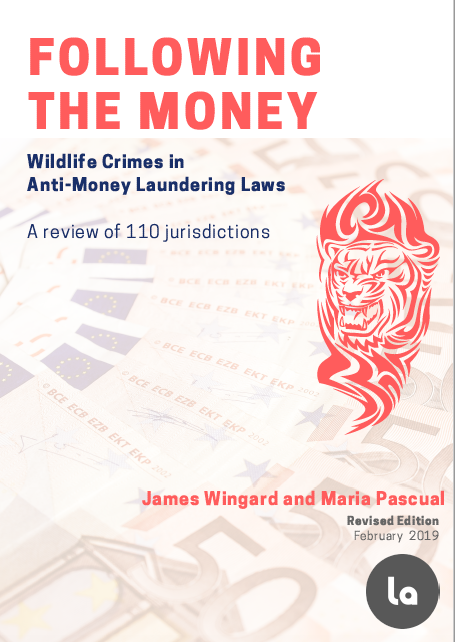 Commissioned by the Foreign and Commonwealth Office of the United Kingdom, Legal Atlas examined the potential for using Anti-Money Laundering legislation for wildlife trade related crimes in 110 jurisdictions around the world. The results of this review are contained in this report. Anti-money laundering (AML) laws have the potential to play a crucial, game-changing role in transforming wildlife trafficking from a low-risk/high-reward to a high-risk environment. Yet despite the 2017 UN Resolution callings on countries to leverage AML laws in the fight against wildlife trafficking, they remain underutilized. One of the reasons for this is the degree to which wildlife crimes constitute a predicate offense. The paper also flags some more general challenges that may hinder the application of AML laws. Correction Notice: The original version of this report contained an error, listing Malawi as having a ‘predicate offense’ approach in its anti- money laundering law, when it is an ‘all crimes’ approach country. This was based on an assessment of the 2006 version of the law, which was amended in 2017 to an all crimes approach. This reference has been corrected, including all affected maps and statistics, as well as the annex. This change does not significantly impact the aggregated results or general analyses. In the autumn of 2017, with the financial support of the Arcus Foundation, Legal Atlas launched the Legis-Apes Project to provide a closer look at the state of legal protection afforded to great apes and gibbons, as well as specific guidance on additional measures range countries may take to ensure full legal protection for them. 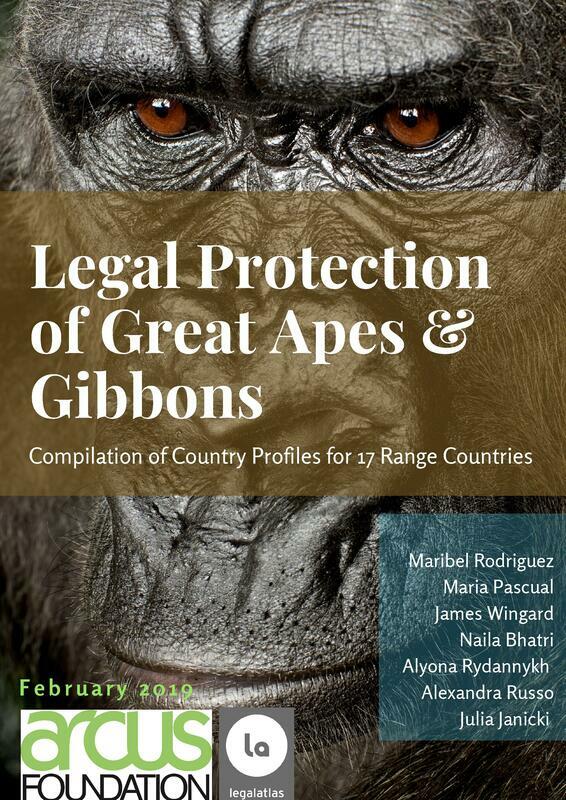 The one-year research effort covers 17 range countries and resulted in the compilation and analysis of 40 international treaties applicable directly or indirectly to great apes and gibbons and more than 330 national laws and regulations. The results of this review are contained in this report. This policy brief, prepared by Legal Atlas, LLC on behalf of GITOC, is the last in a three-part series entitled Digital Dangers published by the Global Initiative Against Transnational Organized Crime (GITOC). The brief draws on three main sources for its analysis: (1) Legal Atlas' database of wildlife-trade-related legislation, (2) current developments, trends and challenges discussed by members of the CITES Working Group on Wildlife Cybercrime, and (3) an analysis of a broad range of articles for jurisdictional challenges of cybercrime generally, as well as the specifics associated with online IWT. Working on behalf of the Wildlife Conservation Society to draft the EU Biodiversity Conservation Strategy for Central Asia as a part of the main Asia report “Larger Than Tigers: Inputs for a strategic approach to biodiversity conservation in Asia.” Legal Atlas' Legal Director, James Wingard, co-authored the regional focus section on a portion of Central Asia that includes all or parts of the following eight countries: Afghanistan, Iran, Kazakhstan, Kyrgyzstan, Pakistan, Tajikistan, Turkmenistan, and Uzbekistan. ​Working on behalf of the Zoological Society of London, this project is a sequel to the most comprehensive IWT study conducted in Mongolia to date, Silent Steppe. This study further investigated trends in IWT in Mongolia. In addition, Legal Atlas reviewed Mongolia’s existing wildlife-related laws and drafted a list of needed amendments. An assessment will be conducted by ZSL training team to provide training that includes things such as IWT product recognition and the use of sniffer dogs. ZSL will develop a more user friendly customs database to provide a clear picture of international border trade and to help identify key hotspots, improving law enforcement. Governance of areas beyond national jurisdiction for biodiversity conservation and sustainable use: Institutional arrangements and cross-sectoral cooperation in the Western Indian Ocean and South East Pacific. This report on behalf of the UNEP-WCMC is to help draft an analysis of institutional arrangements in Areas Beyond National Jurisdiction (ABNJ) (covering approx. 42% of the planet) as part of a Global Environment Fund (GEF) program. ​The project included an analysis of the Southeast Pacific Ocean and the West Indian Ocean as well as the global instruments - treaties, conventions, committees etc. - at work. Legal Atlas took part in the global analysis and the visualization of the data lying at the basis of the regime in place, to help re-evaluate and improve the governance of these areas, regionally and globally. A report drafted on behalf of the Convention on Migratory Species in advance of the 11th Conference of the Parties in 2014. The guidelines contained in the annex of the linked document were written to provide guidance on avoiding and mitigating impacts of linear infrastructure development on large mammal migratory species in Central Asia - and to encourage development of international, regional, and national policies. It contains a summary of related legislation and an analysis of their ability to respond to managing impacts that result from certain types of linear infrastructure. The Conference of the Parties has been invited to consider the Draft Guidelines for adoption. Published by International Council for Game and Wildlife Conservation and the Food and Agriculture Organization of the United Nations, this report is a joint initiative of the Food and Agriculture Organization of the United Nations (FAO) and the International Council for Game and Wildlife Conservation (CIC). Authored by Elisa Morgera (FAO Legal Officer) and Jim Wingard (FAO International Legal Consultant), the report elaborates the basis of Part I of the regional study. It illustrates the relevant international framework and comprises a set of design principles on how to develop effective national legislation on wildlife management for wildlife stakeholders from Western and Central Asia to other countries. ​Published by International Council for Game and Wildlife Conservation and the Food and Agriculture Organization of the United Nations, this study had two objectives. The first was to distill a set of region-specific messages on how to draft effective legislation on hunting and wildlife management. The second objective was to analyze hunting and wildlife conservation laws and the linkages with key related legislation, in particular, forestry and land laws, as well as laws governing related service sectors such as ecotourism. This analysis is based on the assessment of available legal texts on, or related to, wildlife management, as well as interviews with national focal points. From the analysis, the study then focuses on a set of country-specific recommendations for legislative reform or on issues of institutional coordination and enforcement. Published by the World Bank, Silent Steppe is the product of the Environment and Social Development unit in the East Asia and Pacific region of the World Bank to understand the driving forces of wildlife trade, its scale and operation, and to identify successful solutions to address illegal trade. This is an unpublished report for the World Wide Fund for Nature (WWF US). Legal Atlas conducted research into the import related laws and measures in eight countries that can be used to prevent or prosecute the import of illegally sourced wild flora and fauna, marine species, and timber products. Countries included in the study are Australia, Chile, Japan, Mexico, Peru, Singapore, Vietnam, and Malaysia. ​This is an unpublished report for the Conservation Council of Nations, sponsored by the International Conservation Caucus Foundation. Legal Atlas conducted research into wildlife trade related laws for four countries in Africa. The report includes a description of typical wildlife trade chains, a definition of legal frameworks associated with those chains, an initial taxonomy for use in automating a database of laws, and the compilation and cataloguing of laws and legal content for the countries in the study. This is an unpublished report for the Zoological Society of London's Conservation Programmes department. Legal Atlas conducted research into the legal and policy foundations concerning extractives and protected areas, with a particular focus on World Heritage Sites. The final report contains findings and recommendations for presentation at the World Parks Congress in Australia in November 2014. ​In addition, Legal Atlas provided a scoping document for a ‘toolkit’ based on the Legal Atlas platform to conduct compliance assessments based on the World Heritage Convention and assist with compiling, assessing, and improving World Heritage national legal frameworks. This unpublished Report, for IUCN Environmental Law Centre, is a “knowledge document” on pro-poor REDD+ legal frameworks serving as a reference to practitioners and a source for additional publications. It is a supplement to an IUCN knowledge product developed in 2009: “Legal frameworks for REDD: design and implementation at the national level.” While the report takes a look at five specific country case studies, its ultimate objective is to deepen conceptual and practical understanding of the challenges facing the design of pro-poor oriented REDD+ legal frameworks for broader audiences. To this extent, the selected countries are a means to an end – the application of the conceptual thinking to specific contexts to help understand how existing institutional and legal frameworks incorporate pro-poor dimensions.